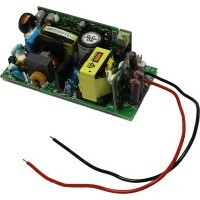 The EPS 45 / 65 -C Series are a range of Enclosed single output switching power supply units from Mean Well. In a compact 4" x 2" size with high efficiency up to 90% and no load power consumption less than 0.3W, this power supply is idea for miniaturised applications. Cooling by free air convection allows a working temperature of -30 ~ +70°C. Typical applications for these power supplies include factory automation, electrical or mechanical equipment and other applications where a low no load power consumption is required.